A father and son stop off in a restaurant for lunch. They order mozzarella sandwiches and momentarily brush off their troubles as they eat and drink. The young boy playfully bites into his meal, stretching the melted cheese out as he chews it down. They smile and laugh together, but soon the father begins to speak of his troubles -- going so far as to work out the wages he'll miss on a napkin unless he can go back to work. It's a simple scene really, both joyous and somber. 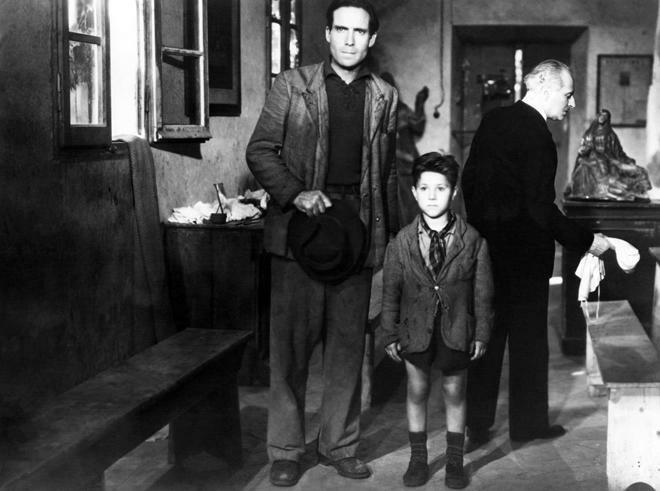 A scene marked by bonding and unassuming truth -- just one of many similar beats that runs throughout Vittorio De Sica's 1948 masterpiece, 'Bicycle Thieves.' And much like the film as a whole, it's a scene that continues to hold a special place in my heart. You see, when I was around ten years old, my father and I would often stop for lunch at an Italian restaurant -- usually after dropping off groceries for my grandmother on the weekend. We'd order pizza and eat and laugh and talk and forget our troubles. 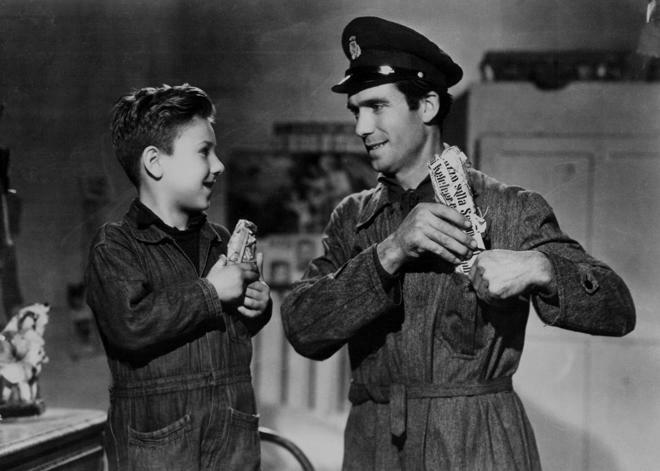 But as the lunch would go on, my Dad would often share his frustrations with me much like Antonio does in 'Bicycle Thieves' -- even going so far as to write out his stressful work schedule on napkins. He wasn't burdening me, mind you, simply talking to me like an adult, helping me to understand the general difficulties of life. Those lunches are now fond memories for me, special moments where my father and I bonded over melting cheese, and whatever emotions are tied to those real life experiences, are somehow also found in De Sica's unassuming images. Achieving a nearly unprecedented level of artistic truth, 'Bicycle Thieves' brushes away all that unnecessary cinematic noise to present "life as it is." And what a joyous, somber, bittersweet life it is. An unemployed father, Antonio (Lamberto Maggiorani), finally finds work hanging up posters around the city. But when his bicycle is stolen, Antonio is left without a means to continue his job. Determined to find his stolen bike, the man and his young son, Enzo (Bruno Ricci), search high and low. As their efforts continue to prove fruitless, Antonio's desperation slowly grows. Taken at face value, the film's narrative really couldn't be any simpler. For all intents and purposes, that brief plot outline above pretty much covers the full extent of the story. Rather than exaggerate drama or construct artificial beats and developments, the filmmakers deliberately try to avoid sensationalized storytelling, instead favoring a stripped down representation of reality. To this end, the runtime mostly focuses on Antonio and Enzo as they travel around the city searching for their missing bike -- and while there are a few twists and turns (for lack of a better word), they don't get any more dramatic than a brief rainstorm and a climactic confrontation with the alleged bicycle thief. But even this potentially fiery altercation ends up playing out rather atypically, refusing to reach the type of satisfying conclusion that a more traditional story might aspire toward. Furthering these Neorealist cinematic goals, the film's overall aesthetic goes on to complement its narrative structure. Avoiding overt visual techniques or flashy editing choices, De Sica mostly opts for a purely functional shooting style. To this end, the movie features longer takes with cuts usually employed only when necessary, taking us to new angles as the story calls for it. Likewise, though still deliberately staged in their own right with subtle implications of meaning, framing and camera movements try not to draw attention to themselves, again helping to reinforce the film's attempt at capturing life unfiltered without muddying its images with cinema's more manipulative attributes. These choices end up constructing a fictional work of rare authenticity, weaving a deceptively simple yet ultimately powerful story about ordinary people dealing with a seemingly ordinary and even mundane problem. But for Antonio and Bruno that "unremarkable" conflict is everything, and through De Sica's matter-of-fact lens we are allowed to completely empathize with their plight, creating a truly moving father and son relationship that proves to be both heartbreaking and life-affirming. In the end, the movie is able to address overarching societal issues related to isolation, desperation, shame, and an individual's ultimate place within an increasingly crowded world. At its most affecting, film is a medium capable of truly connecting with an audience on a deeply profound level. It's a medium capable of such understated reality and universal beauty, that a black and white Italian film from 1948 can somehow directly tie into the personal life experiences of an American critic in 2016. 'Bicycle Thieves' is not only a masterful example of Neorealist filmmaking, it's also a perfect example of everything I love about the simple power of cinema -- a power purely shaped and only limited by the creativity and heart of the artist behind the camera. Criterion presents 'Bicycle Thieves' on Blu-ray in their standard clear keepcase with spine number 374. The BD-50 Region A disc comes packaged with a booklet featuring an essay by critic Godfrey Cheshire and reminiscences by De Sica and his collaborators. The movie is provided with a black and white 1080p/AVC MPEG-4 transfers in the 1.37:1 aspect ratio. Taken from a new 4K digital restoration from a 35mm safety fine-grain master made from the original nitrate negative, this is a rather beautiful image. The source print is in great shape with a very clean image that bears only minor signs of age and stability issues. A light layer of natural grain is retained throughout and thankfully there are no signs of unnecessary processing. For the most part, detail is fantastic with a great sense of fine texture and depth. Patterns in clothing are intricately rendered and one can even make out the text on the posters that Antonio posts around the city. Bright outdoor scenes and one notable sequence set in the rain are particularly impressive. With that said, clarity does waver somewhat from scene to scene with dissolving transitions and a few other shots here and there offering a comparatively soft appearance. On a similar note, overall contrast is good, but the grayscale is a tad inconsistent, with some sequences appearing a little too hot with nearly blooming whites. Black levels are solid, though they can veer toward gray around the edges of the frame. Outside of some fleeting flickering near tight patterns, there are no artifacts to report. 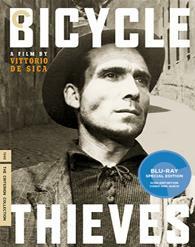 Faithfully restored, 'Bicycle Thieves' comes to Blu-ray with a wonderful transfer. There are some very minor fluctuations in quality, but for the most part, this is a stellar video presentation. The film is presented with an Italian LPCM mono track and English subtitles. Likewise, an optional English dub is also included. Though it gets the job done, the mix is clearly a product of its time. Dialogue is clear and well prioritized throughout, but speech has a relatively flat and faintly muddy quality (and like many Italian films of this period, dialogue was dubbed after the fact and doesn't always sync up well). Thankfully, there are no signs of egregious crackles, hiss, or background noise, and the simple sound design comes through well. Likewise, Alessandro Cicognini's weeping score features solid fidelity, but the music can strain a tad in the high frequencies. Given its age and modest intentions, the mono track is respectful and about as good as one could expect. Criterion has put together a trio of comprehensive and informative supplements. All of the special features are presented in 1080i with Dolby Digital 1.0 audio and English subtitles for the foreign language portions. Working with De Sica (HD, 23 min) – This is a short doc that features interviews with film scholar Callisto Cosulich, the film's co-screenwriter Suso Cecchi d'Amico, and actor Enzo Staiola recorded in 2005. The participants discuss getting involved with the film, the writing process, casting, working with the director, characters, themes, and the movie's reception, rounding out a very worthwhile collection of interviews. Life as it is: The Neorealist Movement in Italy (HD, 40 min) – In this documentary, film scholar Mark Shiel elaborates on Italian Neorealism and how 'Bicycle Thieves' fits into the movement. Shiel discusses other Neorealist movies, along with details on the movement's stylistic and narrative features. Cesare Zavattini (HD, 56 min) – This documentary explores the career of famed Neorealist screenwriter Cesare Zavattini. 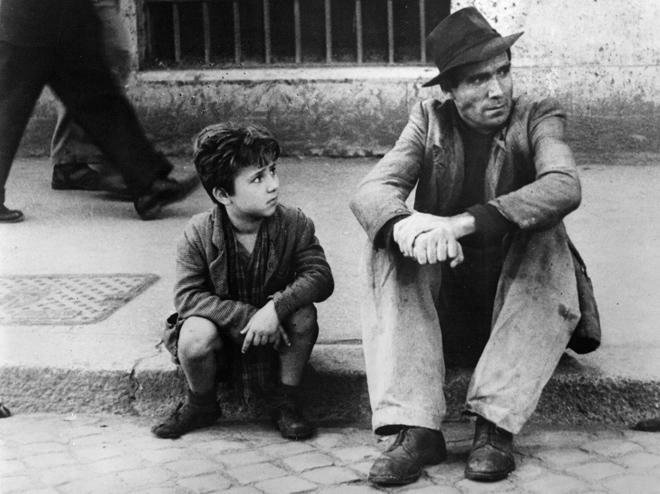 Vittorio De Sica's 'Bicycle Thieves' is a masterpiece of world cinema. A defining example of Italian Neorealism, the film achieves a rare sense of on-screen reality and artistic truth. From a technical perspective, the restored video transfer is fantastic and the audio mix is very solid. While not quite as packed as some other Criterion releases, the included supplements are strong. This is an absolutely essential piece of filmmaking and a genuine must own for fans of art house cinema. Highly recommended.